Brown marmorated stink bugs originated in Asian countries but were accidentally introduced into Eastern Pennsylvania. Today, they are known as agricultural pests and can do great damage to both fruit and vegetable crops. Since their introduction into the states, they have flourished and also become a large nuisance for home and property owners. The species goes into a state of hibernation during the winter months and will invade homes in the fall as they look for a warm place in which to spend the winter months. As their name implies, they are brown in color and adults are 5/8th of an inch in length. They have a distinctive shield-shaped body. 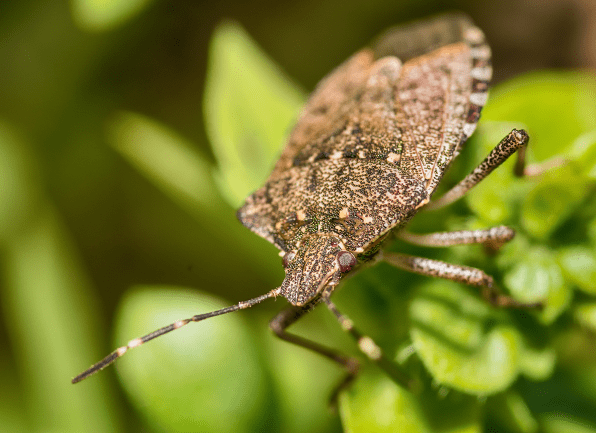 Stink bugs have six legs, are winged and capable of flight. Have scent glands located underneath their abdomen and thorax. Release a very powerful odor (described as a rotten coconut or cucumber smell) from their scent glands when they feel threatened or are squished. Generally remain outdoors but will often invade homes when they become very active in the spring and fall months. Seal cracks and crevices found in your home's siding, foundation and around utility entrances. Caulk gaps found around exterior window and doors. Repair or replace screens in windows and doors that have rips or tears in them.